Coffee is big business in Australia but domestic farmers play a minor role in meeting the strong demand for coffee beans. About 97 per cent of the beans used to produce drinkable coffee are imported – and local suppliers are keen to boost the size of their $10 million market. It’s that kind of opportunity that enticed Jos Webber to give up his veterinary practice in Canberra and become a coffee bean producer in Byron Bay. “I’d done my dash with animals,” he says of his decision to become a specialist farmer (though he does still do consulting work in animal health and food safety). 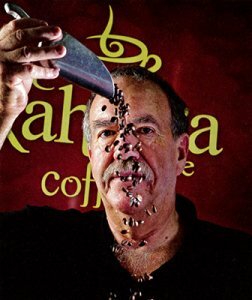 Webber bought land in Byron Bay that had been used as an avocado plantation in 2003 and he has since overseen the growth of the Kahawa Estate coffee plantation. The estate produced its first beans in 2007. Coffee trees have a useful life of about 20 years and produce beans once every two years, making every crop crucial. He now has about 11,500 trees producing about five tonnes of beans a year and has sold about $15,000 worth of coffee beans in the past six months. Australian coffee farms are disease free and don’t use pesticides. Our coffee is good, it is local, and it is fresh. About 3 per cent of the coffee beans consumed in Australia are grown here, in either the Byron Bay hinterland or far north Queensland. Beans are contained within cherries – the fruit of the coffee tree. The beans must be roasted before they can be used to brew coffee. Roasting offers better margins than growing, says Webber, but these pale into insignificance compared with the money being made by cafe owners. About 10 per cent of the cost of a $3 cup of coffee can be attributed to the wholesale cost of the beans, he says. Traditionally the coffee bean market is dominated by African and South American producers and most top quality coffee is grown at high altitude in places such as Kenya and Colombia. Webber, who is also president of the Australian Subtropical Coffee Association, says climatic conditions in Australia’s coffeegrowing areas are ideal, despite the lack of altitude. Webber says it is his love of a challenge that got him involved in the industry rather than a love of coffee. Although he is now a regular drinker of his own product, he says he was once content drinking instant coffee before he started the farm. “Back then I had no real appreciation of coffee at all,” he admits.